ROYAUME UNI – – Bath - Experts are sifting through what is believed to be one of the largest hoards of Roman coins ever found in Britain after an archaeological dig in Bath. It is thought there could be as many as 30,000 silver coins in the collection found during work on a new city centre hotel. Now the Roman Baths has launched an appeal to raise £150,000 to acquire, conserve and display the third century coins. The hoard dates to 270AD, at a time when the western Roman empire was threatened by civil war and barbarian invasion. Thousands of coins are fused together in a large block, making identification and counting difficult. Conservators at the British Museum in London are expecting the task of analysing the coins to take a whole year. The discovery - known as the Beau Street Hoard - began to be made in 2008 at the site of work on the Gainsborough Hotel in Beau Street. It is being described as one of the five largest hoards ever found and the largest from a Roman town. USA – Harrisburg - When members of the North Central Chapter 8 of the Society for Pennsylvania Archaeology brought a piece of American Indian pottery to experts from the state museum in Harrisburg, they found that it was a rare artifact for the area. The piece of pottery that had museum experts excited was a top of a clay pot found in Lycoming County that was made by a group of American Indians that is now called the Clemson's Island culture. Baird said the piece dates back to A.D. 1050, more than 1,000 years ago. The Clemson's Island people came from a territory in New York and colonized in our area until war pushed them back to their original territory. Baird said the culture eventually would become the Iroquois. Baird's group of amateur archaeologists were able to tell who made the artifact - found in a summer 2011 dig at the site of an old lumber mill - because of round punctates found around the entire rim of the pot. Punctates were a trait of all Clemson's Island pottery. 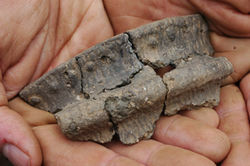 Baird explained during the dig where they found the artifact, he had been following a fire ring from the same culture. He had uncovered one fire ring already and recently had stumbled upon another. ROYAUME UNI - St Andrews - Human remains have been unearthed in one of Scotland's most ancient towns during road repairs. Experts say the skeletons found at St Andrews could be those of a group of Franciscan monks who lived there in the 15th century. Resurfacing work at the town's Greyfriars Garden has now been halted for the remains, found six inches from the surface, to be excavated and preserved. Fife Council's archaeology team has spent years trying to pinpoint the exact location of the monastery inhabited by the monks. It is thought that the friary was established in St Andrews in 1458, a relatively late development in medieval St Andrews. It was completed in 1478 but ransacked in 1559, during the reformation. Skeletal analysis is likely to take place soon and experts hope it will reveal more about the lives and deaths of the bodies involved. FRANCE – Saint-Flour - Trois bustes reliquaires masculins d'époque romane étaient, jusqu'à aujourd'hui, connus en France et en Europe : saint Césaire de Maurs, saint Baudime de Saint-Nectaire et saint Chaffre du Monastier. Une nouvelle pièce est apparue récemment à Saint-Flour provenant d'un don fait au diocèse par une famille sanfloraine. Cette statue extraordinaire - un buste reliquaire du XII e siècle découvert à Saint-Flour - bien que lacunaire - la tête manque ainsi qu'une main - est une découverte archéologique remarquable.